Frustrated by the hidden costs of your slow network? 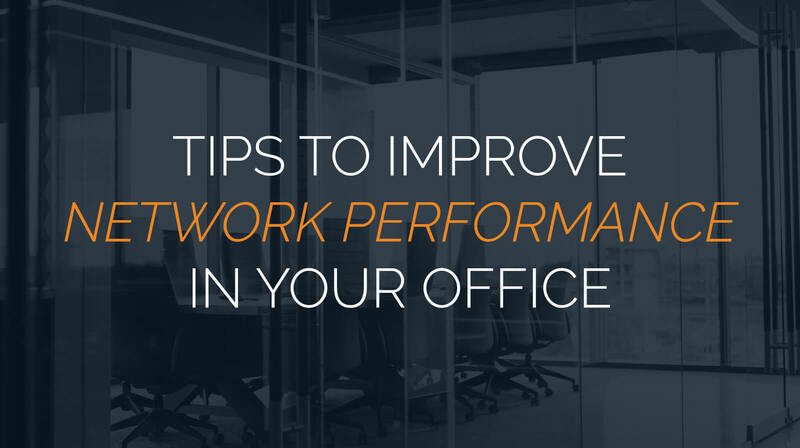 Here’s how to improve network performance. For many businesses, the hidden costs of dealing with a slow network can be like death by a thousand paper cuts. Files take longer to send, cloud applications take longer to load, calls are dropped, and everyone loses productivity waiting for tasks to finish. Because of the urgency of having a reliable network connection, many businesses are quick to respond to the situation by throwing money at a network upgrade that may not work. While the cost of fiber Internet is more affordable than ever, it’s still important to diagnose alternative solutions to guarantee peak performance. 1. Determine that your network is at fault. Is your network actually slow, or do you just have slow computers? You can’t proscribe a cure without knowing the disease, so it’s best not to leap to conclusions. Make sure that the sluggish response time is more than just a localized issue before springing for an infrastructure upgrade. 2. Offer guests a different network. Network slowdowns are sometimes the result of guest behavior. While it’s unlikely that a single guest streaming a YouTube video in your lobby is the source of your troubles, you could have problems if you frequently host a large number of guests who need Internet access. Rather than risk them inadvertently slowing down your operations, offer them a login to a guest network. 3. Educate personnel about user behavior. Employees need down time, and many choose to spend that time on their computers. If you notice a slowdown during lunchtime every day, it could be because a couple coworkers have taken the opportunity to boot up a video game or stream a show on Netflix. (Yes, it’s been known to happen!) They probably aren’t even aware of the network resources they’re draining during work hours, and are just trying to enjoy their lunch. Most will be happy to choose a different lunch pastime if you take a moment to talk to them about network performance. Other personnel behavior that might be causing a slow down could involve poor file sharing practices, such as emailing large PPT files to multiple contacts rather than editing them via a shared cloud file. If you have employees frequently (and needlessly) sharing extra large files, teaching them how to compress the files or how to use cloud drives can cut the strain they’re placing on the network. 4. Use VLANs to segment low-priority traffic. VLANs (Virtual Local Area Networks) are an excellent way to partition your network resources such that the most critical traffic receives the highest priority. Essentially, a VLAN offers the benefits of a completely separate network, without having to rewire the entire office. You can group VLANs based on computer use and function, even if they’re in separate parts of the office. VLANs can also improve security by segmenting your systems from each other. That way, even if one part of your network becomes compromised, the VLAN can act as a barrier, keeping other parts of the network safe. 5. Check for viruses or system defects. Speaking of viruses, malware is known for slowing down networks and inhibiting workflows. If you suspect your network slowdown might be the result of malicious network activity, you should have an emergency IT specialist run a check on the situation right away. Slowdowns can also be the result of different network components growing old and defective. It’s often relatively painless to replace these broken components, rather than upgrade the entire network. Network monitoring is critical for diagnosing any range of potential bottlenecks or traffic jams in your network. For instance, system backups typically absorb a large quantity of resources. Because of this, most networks run their backups at night, when employees are out of the office. But sometimes the scheduling on those backups is off, or a backup takes longer than expected and begins running into the work day. Remote Monitoring and Maintenance (RMM) services can spot these sources of congestion, allowing IT staff to devise more effective workarounds. 7. Update software and firmware. Advancements in technology and the software that runs on it don’t always keep pace with each other. You may have new programs running on old machines, or old programs running on new ones—either way, it’s unlikely they’ll work well together. If you’re tied to an old software system simply because that’s the way it’s always been done, it may be high time you set it aside in favor of something more compatible with current technology. Otherwise, your fondness for the software of yore could strand your business in the stone age. Last but not least, it may just be that you need to upgrade your network. While you certainly should do your due diligence in seeking out other remedies, the truth is that networks do wear out, and sometimes they need replacing. Fortunately, as we said earlier, fiber Internet has never been more affordable. If you’re still running on old cabled Internet, a new wired connection could smooth over your greatest delays. Networks don’t stay perfectly optimized forever. No matter how efficiently you configure your network today, nothing stays the same. Your applications will change, your business will upgrade devices, customer demands will shift, and your network will fall behind. Efficient, high-performing networks require oversight and maintenance. Fortunately, we’re here to help. Brightline Technologies offers RMM services to businesses that require network monitoring. We also work with companies to diagnose network slowdowns, create optimal network configurations, and improve network performance. We offer a free network assessment for all new customers so that we can create a solution that best fits your needs. If you would like to get started, contact us today. « IT Planning: How Far into the Future Can You Prepare?